Japan’s Infinity Storage Media announced this week the world’s very first BD-DVD hybrid disc. This disc will be formatted to playback in a standard DVD player and Blu-ray Disc player while preserving a label-side. Both formats will be on the same side. The first layer (closest to the surface) is a single-layer BD25 (25GB) followed by two DVD layers (8.5GB together). This hybrid format will play in regular players. 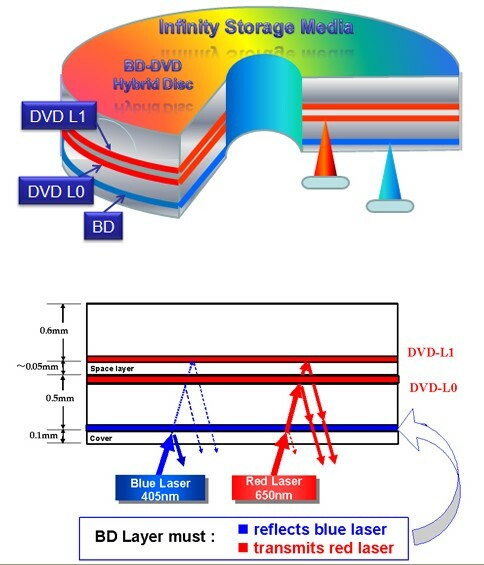 Infinity Storage Media says they are working on a dual-layer BD/single-layer DVD hybrid disc as well. This will have 50GB for Blu-ray and 4.7GB for DVD.